This corset was dreamed up to evoke to feelings of a 50's style mental asylum. 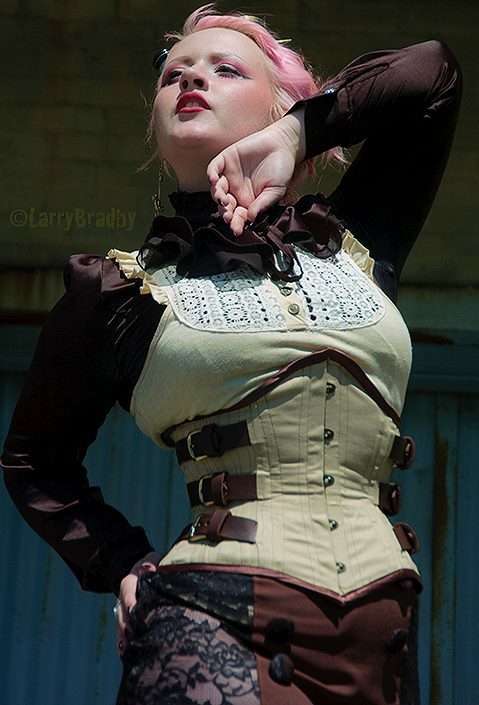 Constructed from a cotton twill exterior and genuine leather belts with a cotton twill liner, this corset is perfect for Steampunks and Goths alike. 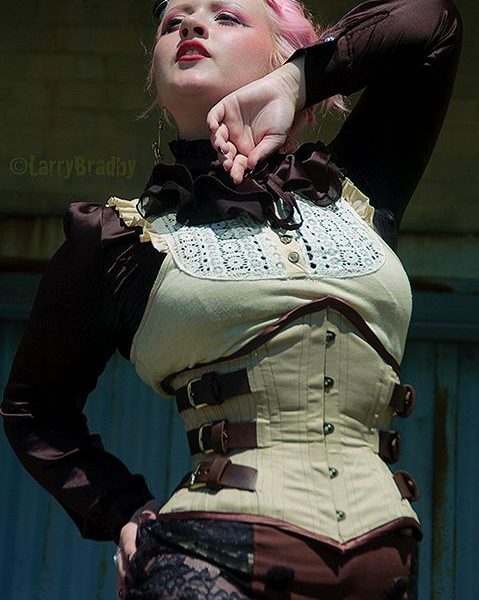 This corset uses genuine leather belts and a khaki twill, tied together with brown satin laces, antique brass hardware, and best of all, real coutil! We hand make all of our corsets right here on the Eastern Shore of Maryland using on the highest quality materials available. Hand-cut spiral steel bones make up the body of this corset, creating a durable and reliable waist, with a flat steel reinforcement at the grommets for extra strength. A high quality busk, underbusk and hand set grommets create strong and reliable corset closure. Our liner and interliner thread and bias are made from cotton to give this corset extra strength and allow your body to breathe. Our corsets have a heavy feel that you cannot find in the mass produced cookie-cutter corsets. Because our corsets are custom made, so we ask 3 to 4 weeks for the completion of your masterpiece. All sales are final on custom made corsets and no returns will be accepted. See the Corset Glossary for a description of all corset styles.